European titanium dioxide (TiO2) demand remains muted in late January, but some pick-up is likely during the first quarter amid preparation for the high season, albeit with some moderating factors. Buyers have been running down stocks since the second half of 2018 and into the first quarter of 2019, mainly because of low season factors and falling prices during that period. In late 2018, Chemours CEO Mark Vergnano and Venator CEO Simon Turner talked of volume declines and de-stocking activity, with Vergnano anticipating that this tendency would continue in the first quarter of 2019. Other players also talk of de-stocking activity still taking place in some cases for TiO2 buyers and their customers in late January, due to caution about inventory levels amid the fragile economic climate and seasonally reduced activity. Freezing conditions in Europe continue to stifle TiO2 activity from the main paints/coatings sector. However, there is some expectation that demand for paints/coatings could pick up to some extent during February or in March, depending on the weather and economic conditions. Looking to the price expectations for the second quarter, it is seen to be too early to provide any real concrete indications. However, some players suggest that price stability or pulls in either direction may occur, depending on to what extent any seasonal pick-up in activity materialises and how availability from domestic and import sources pans out. A few source suggest that if demand increases seasonally then this could give rise to a stable, if not firmer price sentiment, although this will also depend on availability. A few buyers, by contrast, believe that any seasonal pick-up in activity could be dampened by the fragile economic climate and downstream affordability concerns, which could lead to stable, if not lower prices in the second quarter of 2019. Talk of feedstock supply limitations and cost implications could also have a bearing on TiO2 prices over the coming months, although pricing is mainly driven by market factors. 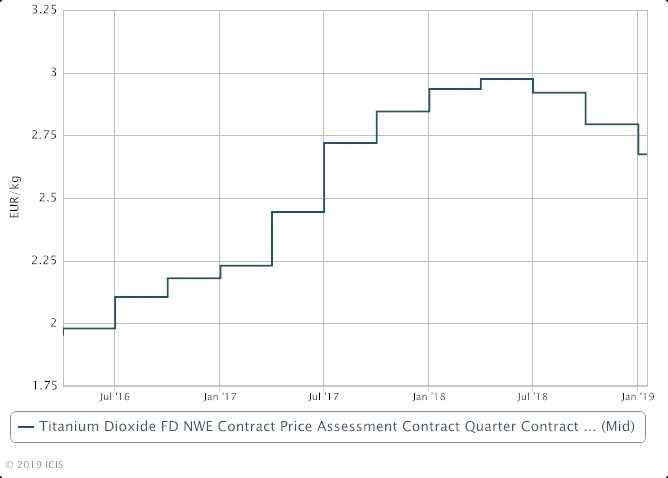 European TiO2 contract prices in the first quarter were assessed at €2.55-2.80/kg FD (free delivered) northwest Europe, down by €0.10-0.14/kg from the previous quarter. This marked the third consecutive quarter of price drops, on the back of a well-supplied market and reduced activity. Prior to this, European TiO2 prices were subject to a two-year period of successive and sizeable price hikes between the second quarter of 2016 and the second quarter of 2018, amid tight market conditions during this period.